Rocket League has turned out to be a big hit on the PlayStation 4, keeping gamers hooked with its unique blend of soccer and demolition derby. For those new to the turbo-charged sport, here are a few helpful tips to get you up and running. 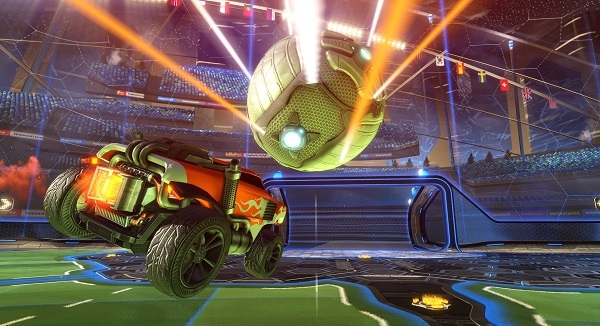 Recently released as part of the PlayStation Plus lineup for July and already available through Steam, Rocket League puts players behind the wheel of souped-up buggies on a massive soccer pitch. Boasting game modes that range from 1v1 on up to 4v4, players race around the field in an effort to launch a massive soccer ball into an equally humongous goal. Picture a cross between Burnout and FIFA and you’ve got the basic idea. I wrote earlier about how much I’ve been enjoying the game, as Rocket League offers an addictive brand of action that keeps drawing me back in for “just one more match.” As I’ve learned more about the nuances of this unique sport, however, I’ve noticed that quite a few players still speed around the arena like a chickens with their heads cut off. To that end, I offer these beginners tips to help improve your game and hopefully earn you a few more notches in the Win column. If you have some tips of your own, please add them in the comments section below. It’s important to remember that just because you can hit the ball doesn’t mean that you should hit the ball. A lot of players seem to think that Rocket League is all about seeing who can hit the ball the most times until it eventually rolls into one of the goals. This leads to a ridiculous amount of congestion around the ball, as well as players messing up a teammate’s shot or knocking in an own goal. Think about where the ball is going to go if you hit it. If you aren’t going to progress your team’s efforts, maybe exercise a little patience and plan your strikes for when they’re going to do some actual good. I can’t stress this one enough. If your teammate looks like they’re going to be able to hit the ball, let them take a crack at it. Keep your spacing wide and you’ll be surprised how many opportunities present themselves. If they miss the ball, you’ll be able to provide a follow-up attempt. If they make contact, you’ll be in a better position to capitalize with another pass or a shot on goal. This is especially important when you are right behind your teammate. I can’t tell you how many goals have been botched because a teammate decided to boost directly into me or smacked the ball off course because they got greedy for a goal. I’ve seen a lot of folks hit the gas at the start of a match and never let up. Your buggy has a lot of maneuverability options and, quite frequently, hitting the brakes or reversing are the best way to get yourself into position for a shot. It’s also important to remember that the available double-boost jump is not always the best choice for taking a shot on goal, though many seem to assume it’s the only option. This all ties back into thinking before you act. If you hit the ball too hard when you’re too close to the goal, chances are pretty good that you’re going to bounce the ball off of the arena wall rather than light up the scoreboard. Sometimes simply ramming the ball or bumping it with a single jump is all that’s needed to send it sailing into the back of the net. After each goal, players are spread out evenly across the field before a countdown leads to the next kickoff. If you aren’t randomly dropped into one of the forward spots, you’re almost never going to be able to make it to the ball first. Instead of sprinting forward and crashing into everyone, consider playing defense for those opening moments. This goes quadruple if you spawn in the goalie box for the kickoff, as you’ll be your team’s only line of defense in case one of your opponents earns a lucky opening shot that makes a beeline straight for the net. A good defensive player is just as important as a striker, and holding back will give you a better view of all of that action, meaning you’ll see some pretty tasty scoring opportunities open up and have plenty of room to capitalize. After you’ve got the hang of your car’s basics, it’s time to practice some more advanced Rocket League techniques. There’s a perfect arena for working on these maneuvers in the practice menu, so don’t be afraid to take a break from the competition in order to improve your own skills. Your car can cruise along the arena walls easily in Rocket League, so getting used to driving like a mechanical Spider-Man will do you a lot of good and open up shots and defensive maneuvers you didn’t have access to before. And remember that double jump we were talking about earlier? That move can actually work like free boost, helping you move around the field quickly without using up your charge. Just get rolling, hold forward and double tap the X button. Now you can use all of that charge you saved up for the final advanced maneuver: Flight. I find that flying is easiest to control when you aren’t moving too fast, so keep that in mind before you try to go airborne. Just hold back on the stick, hit jump and start feathering the Circle button (Holding it down may cause you to careen out of control). Done correctly, this will send you sailing into the air in a semi-controllable glide, perfect for getting to those hard to reach bounces and opening up all kinds of shots many players won’t be able to counter. I’m still getting the hang of flight, but already I’m finding more opportunities to help out my team with a high-flying nudge or shot on goal.